Mindful Parenting is closing out its latest (and possibly LAST!) eBundle with a big-bang sale + special bonuses!!! 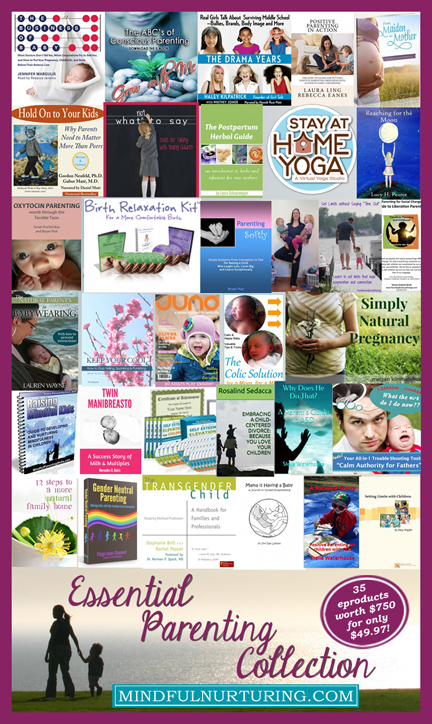 The Essential Parenting Collection of 35 eProducts comprises a comprehensive library of conscious parenting essentials for one tiny price… and the price just got WAY tinier: rather than the original great price of $49, for this final week the entire eBundle is just $32!! The eBundle includes eBooks, eAudio, eCourses, coloring pages, an eMagazine, and more, on the topics of Pregnancy and Birth, Parenting the Early Years, Child Development, Mindful Guidance, and Resources for Parents. Hold On to Your Kids — by Gordon Neufeld and Gabor Maté, two of my IDOLS. I sometimes recommend this book (especially to parents of older kids) even before my own! Get the full scoop | Grab This Final eBundle Deal! fact that I receive an affiliate/contributor portion of proceeds from each sale! This entry was posted on Monday, April 21st, 2014 at 3:29 pm	and is filed under Resource/Offer. You can follow any responses to this entry through the RSS 2.0 feed. Responses are currently closed, but you can trackback from your own site.